Perfect for the Superbowl or ANY time! This is a family favorite recipe! And since they’re baked, I don’t mind making them! I make lots of extra so that we have leftovers for wraps and salads, too! In a large Ziploc bag mix together the flour, paprika, cayenne pepper, salt, garlic and onion powder. Place chicken strips into the bag, a few at a time and shake until they are evenly coated. Repeat with remaining strips. Place coated chicken into a non-porous, glass dish. Cover and refrigerate for 60 to 90 minutes. *Do NOT skip this step! Heat oven to 400 degrees. Spray large baking sheet with cooking spray, place chicken on the pan and spray the chicken until evenly coated. Bake the coated chicken for 30-40 minutes, (turning once) or until parts of the tenders begin to turn brown. Meanwhile, warm the hot sauce, pepper and garlic powder in a small saucepan over low heat. Stir together and heat until mixture is warm. Remove from heat and reserve for serving. *For extra crisping, you can broil the chicken for 3-5 minutes at the end. Remove from oven, place baked tenders in serving bowl, add hot sauce mixture and stir together. 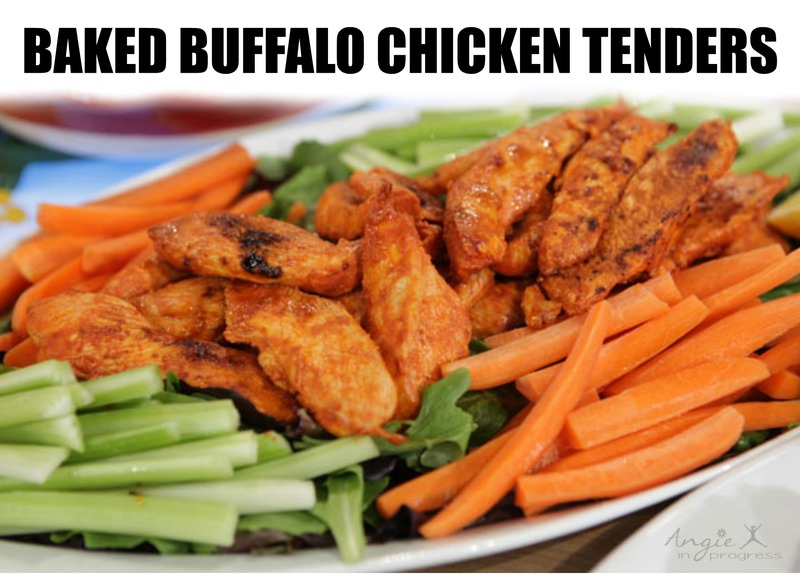 Serve with celery and carrot sticks and a the blue cheese dip. Container equivalents: 1 RED and 1 tsp. Calories: 158, Protein: 26 g.
The Portion Fix container system has helped so many people SEE what proper nutrition and portion sizes look like. Planning is easy: if it fits in the container, you can eat it! 🙂 When combined with daily exercise, my customers who follow this plan lose up to 3-5 pounds per week. And you’re eating clean, whole foods, which keeps you full longer! Try my online workout library for FREE! If you are looking for daily support, and motivation…my customers have access to my private accountability groups as well as 24/7 support and guidance from me. Apply below and I will help you pick a program that will help you reach your goals! Previous PostPrevious Salad Dressing with your Pancakes?